I’ve visited Indonesia on multiple occasions and each and every time it is such a rewarding experience. The people and culture are always so welcoming you can’t help but to feel at home there. So I thought I would put together a list of my Top 5 Favorite and Most Memorable places I have personally visited in Indonesia. 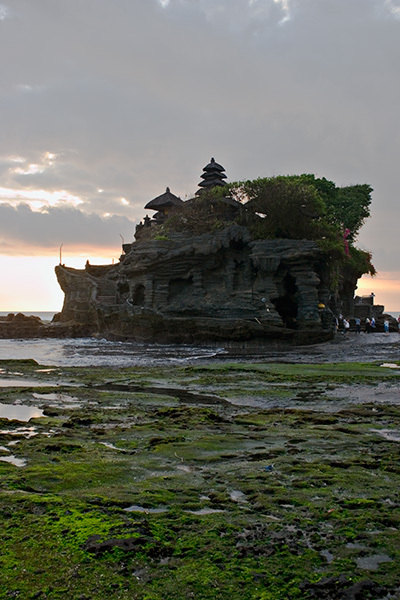 Purah Tanah Lot – Located in Tabanan (about 20km West from Denpasar) this temple is basically a large rock formation just a few meters offshore. It was founded by the 16th century priest Nirartha and is dedicated to the guardian spirits of the sea. Tanah Lot literally means “Land in the middle of the sea”. During low tide you can easily walk out to it. The temple itself is not accessible to visitors but there are plenty of locations to get great views and photos. It is a great location to get some fantastic sunset photos of the ocean and temple. As always you will want a tripod to get the best evening photos. When I was there I took a few shots from the beach by the temple but I also saw plenty of cameras up above me on some terraces. I may try that location next time. Also, to the right of the temple further down the shore is another outcropping that affords nice views. Make sure and check that out as well. Purah Luhur, Ulu Watu – this temple is located in Pecatu village and is about an hour drive from Kuta toward Jimbaran. 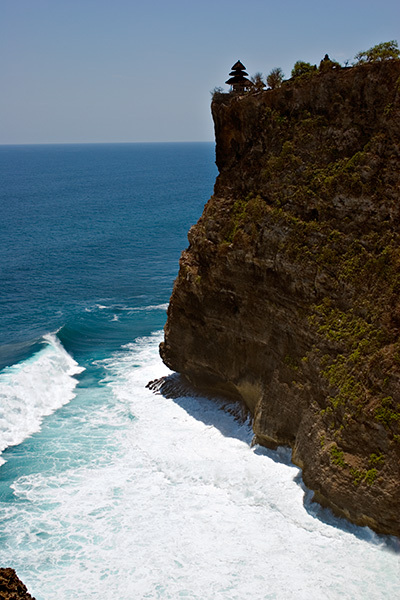 This is just an amazing temple perched high on cliffs overlooking the coast of Southern Bali. You can walk along the cliff edge and get fantastic views up and down the coast. I happened to be there on a very hot day and the heat was almost unbearable. I would have liked to have stuck around and enjoyed the sunset but I’ll just have to save that experience for the next trip. One thing to note is that there are naughty monkeys here. I know it sounds funny but they will jump on you and try to take shiny things from you like glasses and lens caps so keep loose items out of sight. We didn’t have a problem and I think that was due to being there when it was so hot. I’ve heard that some people have been able to get back swiped items by exchanging it for fruit. One thing to note is that the ocean water below the cliffs is an incredible blue color. I took some shots just of the water and they made some cool abstract prints. Uluwatu is also the place where the Kecak Dance (monkey dance) is performed between 6 PM and 7 PM. I hear it is a spectacular show and not to be missed. Another reason to return to this spot. Pura Besakih – located about 2 hours northeast of Ubud, Pura Besakih sits on the foothills of Mt. Agung. It is often referred to as the “Mother Temple” and is the largest and most important temple on the island. Founded in the 8th century it is an incredible complex with somewhere between 30 and 38 individual temples. The climb to the top affords a spectacular view. The weather however, did not cooperate during my visit and I was unable to get any photos of Mt. Agung in the background and in fact while I was there I wasn’t even aware of the incredible backdrop hidden behind the clouds until I saw photos of it later. I would love to go back when the weather is better and get some more spectacular photographs. The climb to the top of the complex is pretty strenuous and a great workout and well worth the sweat expenditure. I would advise hiring a guide to explain the history but make sure and negotiate the price beforehand otherwise you might be surprised at the conclusion of your tour. Pura Ulun Danu Bratan – this temple was built on Lake Bratan in 1633 according to an ancient manuscript of the Mengwi Kingdom. It is half on land and half on a tiny island. 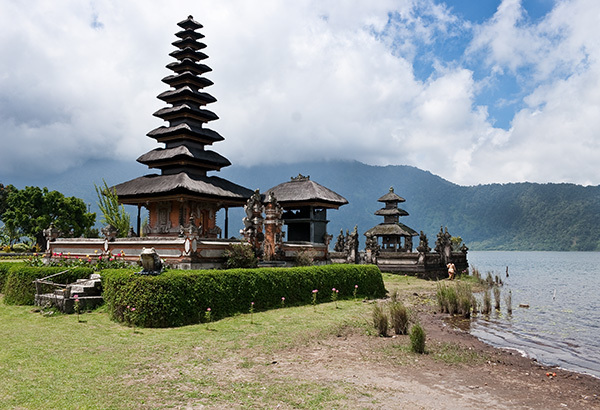 The temple itself is 3-tiered meru (multiroofed) and dedicated to the goddess of the sea and lakes, Dewi Danu. When I was there the water was not completely surrounding it but I have seen photos where the water of the lake completely encircles the temple. The grounds are very nice and it is a peaceful environment. I really liked this place due to the beautiful scenery of the lake. There is also a beautiful garden of flowers to explore as well. We were there in the afternoon but I really want to go back in the early morning to photograph the temple against the backdrop of a calm morning sunrise. 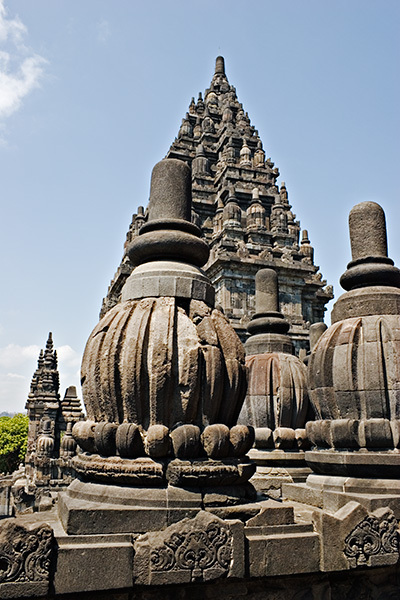 Prambanan is the largest Hindu temple in Central Java and was built in the 9th century. 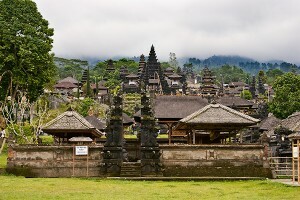 It is located about 18km east of Yogyakarta. It is absolutely spectacular so it is not surprising that it is a UNESCO World Heritage Site. I was there in 2005 and I understand the temple was damaged by the 2006 earthquake that struck the region and I am not certain that visitors can go through the inside of the temples as I was able to do in 2005. Photos cannot do justice to the sheer size and design of this temple complex. Go with a tour guide that is provided because they offer so much historical information that you would never get anywhere else. Our tour guide was amazing and we got so much more out of the experience thanks to him. The temple complex is comprised of three zones; the outer zone, the middle zone (which contains hundreds of small temples) and the inner zone which is considered the most holy and contains the eight main temples and smaller shrines. There are carved relief panels around the Brahma and Vishnu temples which depict the story of Ramayana and the detail is just incredible. When I return I want to take some night shots of Prambanan. I understand that between May and October there is a ballet performance of the Ramayana at a theatre with the temple lit up as a backdrop. I’d love to photograph this spectacular event if I can time it right. If you get the opportunity to see Prambanan in person don’t pass it up. 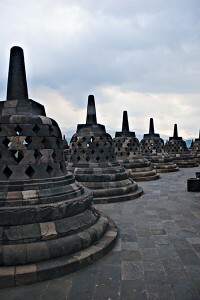 Borobudur is another UNESCO World Heritage Site having been built over a 75 year period in the 8th century. It is a Buddhist monument located in Magelang in Central Java. The monument is basically six square platforms on top of each other and then topped with three circular platforms. There are 2,672 relief panels and 504 Buddha statues with the top platforms surrounded by 72 Buddha statues in stupas. The narrative panels tell the story of Sudhana and Manohara. Its sheer size is just amazing. When I was last there it was late in the day just a few hours before closing and I got the opportunity to take a few sunset photos from the top. I suggest arriving earlier in the day and spending more time to do the full walk around all levels. Next time I want to do the sunrise tour which allows you to enter the temple gates at 4:30 AM in time to see the sunrise and be able to explore the temple for an hour and a half before the crowds arrive. 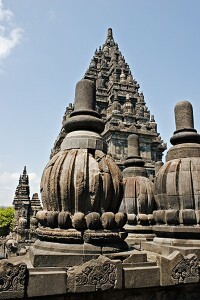 Also, as with Prambanan make sure and hire a guide. It is well worth the money which at the time was Rp 50,000. 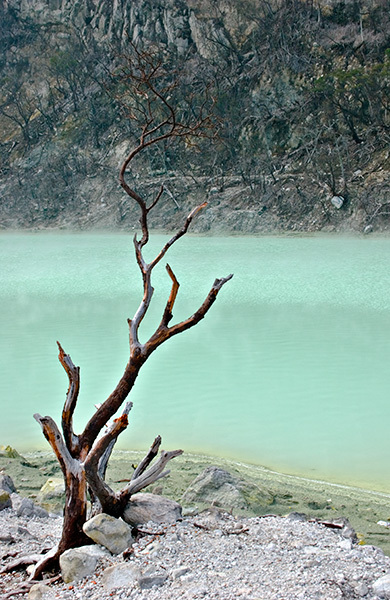 Kawa Putih or White Crater is located about 50km south of Bandung City on the foot of Mount Patuha. The drive up to the crater meanders uphill for several kilometers and seems to keep going up and up. The views from the ridgeline of the valleys below is spectacular although at times there was fog obscuring the view. Once you arrive at the parking area it’s a short walk up some stairs and then down the other side to the crater. The first thing you will notice is the strong smell of sulfur. In fact as we crossed near what appeared to be a small cave on the side of a cliff face I actually couldn’t breathe because the smell was so strong. I am not sure if it was due to sulfur or some other volcanic emission but it really burned my eyes, throat and lungs. I’ve read that at times the sulfur content can become so strong that they have to close down the crater. The crater is surrounded by steep rocky cliffs that meet up with steaming milky turquoise colored lake water. The trails of steam rising off the water give the place a magical appearance. The color of the water can change dramatically depending on the sunlight. 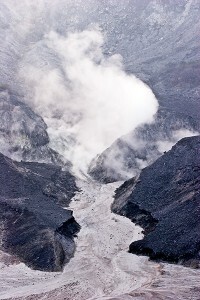 Tangkuban Perahu is an active volcano located about 30km north of the city of Bandung. You can drive right to the edge of the crater, park and explore the area. On the drive up you pass through scrawny pine forests that I found interesting because the bark near the base was cut and sap was oozing everywhere. I never did find out what was going on with that. On this particular day the forest was infiltrated with wispy fog and a strong smell of sulfur. When viewed from a distance the volcano has a shape of an upturned boat which is precisely what Tangkuban perahu means and is expressed in the legend of Sangkuriang. There are three craters which can be explored: Kawah Ratu (Queen Crater), Kawah Upas (Upas Crater) and Kawah Domas (Domas Crater). You can walk down to Kawah Domas to see the hot geysers but this area was closed when we were there. I had heard that the entire volcano was closed off just a few weeks before we were there due to fear of an eruption. It is quite amazing to be standing on the rim of an active volcano looking down into the steaming and smoking center. This is definitely a place to check out. I can’t wait to go back and see some of the other craters. So those are the 5 locations in Indonesia that rocked my world. Of course there are so many other incredible places in Indonesia but these are the ones that really stuck in my mind as beautiful and inspirational. If you ever get a chance to visit Indonesia make sure and put these on your “to see” list. You won’t be disappointed. If you’ve been to any of these locations leave a comment on your experience or feel free to contact me directly with your story. Informative write, Matt. And a very nice website. Is it going to be mostly about Indonesia? @Eki – Thanks Eki. Right now Indonesia is the main Country I have spent time in so my writings about travel will focus on that but later this year I have plans to visit Cambodia and Nepal. I’ll also be posting information on the desert Southwest of the US including places like Zion and Death Valley. Matt, you’ve been to some incredible places. Quite the world traveler. Great read and pics! Thanks Sage! I’ve been very fortunate to have seen some incredible sights. Can’t wait for the trips I have planned this year. I’m ashamed to say that I still haven’t gotten the chance to go to Yogya and see Borobudur & Prambanan 🙁 You’re post reminds me that I need to focus on this more! great photos! there are still many other beautiful places in Indonesia matt .. like Raja Ampat in Papua, Komodo Island and others. You can search on google to know the area. You’ll find the natural beauty of Indonesia are amazing! Hi Fitha. Thanks for the suggestions. We may have to check out those areas and others. We will actually be in Indonesia for 3 months later this year and hoping to see some new sights. You are correct…Indonesia is beautiful and amazing! Can’t wait to be back. Cheers! Thanks for the tips! When we were last there they had closed some areas due to volcanic activity. In fact after we left they closed the whole place for a bit. We will have to check out the waterfall and caves. Sounds like a good place for photos. I certainly will dare to explore!